Currently, in the world of melodic hard rock and heavy metal, I find three types of albums a challenge to review: those from current American metalcore bands, guitar virtuosos especially if totally instrumental, and as is the case for this review, female fronted symphonic metal bands. For the first and the last, the ring is more full with players than a wrestling royal rumble match. Fundamentally, and thanks to plethora of bands, there's a redundant monotony to the music. Every new band thinks they're better and different than those before when actually they're only reinventing the well. The challenge for the reviewer (and listener) is to find what's novel or promising about the newcomer. With Greece's Bare Infinity and their debut 'Always Forever,' this is a significant feat. Probably, the best thing that can be said about Bare Infinity and their power metal based symphonic gothic metal (that's a mouthful) is that they do it very well. This does not make them better, worse or more original than they're peers. They're not. It simply means that they know their musical style and perform it with acumen. Otherwise, Bare Infinity is derivative: a brilliant and operatic female lead vocalist, thick symphonic arrangements founded upon a quick charging power metal base, lush vocal arrangements, and an average dose of growling death vocals thrown in (often needlessly) for good measure or current metal market appeal. There's really nothing new here. However, it did notice at least two interesting things. First, is that vocalist Angel does not depend entirely on the traditional Tarja operatic style throughout. On 'Escape' and 'Here I Come' she sounds more like a traditional heavy metal singer, and that was a nice break. Secondly, possibly the most impressive thing for this listener was the prominent place Sverd's bass playing was given on several songs. These 'Serenity' and 'Thrill Neverending,' but most significantly on 'Escape' where he is positively brilliant. 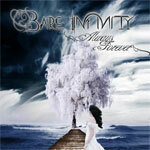 Bare Infinity's 'Always Forever' is standard, and generally derivative, symphonic gothic metal performed very well. If you like Nightwish, After Forever, Delain or the gaggle of other female fronted bands of this type, you will probably eat this stuff up. Just don't expect much nourishment.